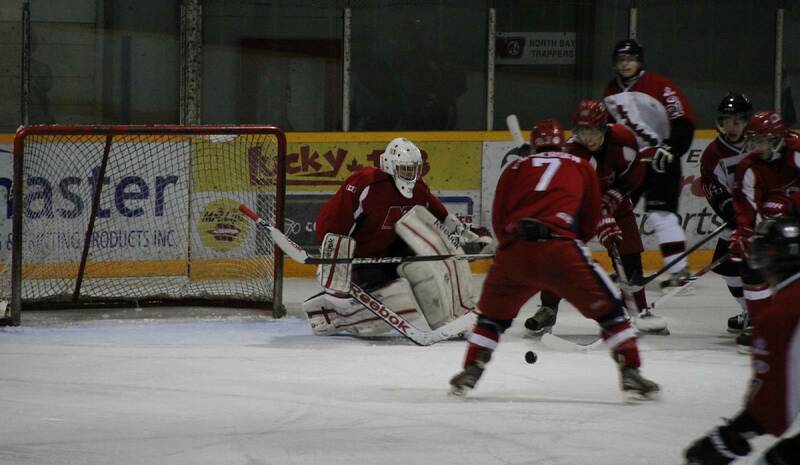 Jr . Trappers, seen here at West Ferris arena early in the 13-14 season, will be moving to Mattawa for the 14-15 season. PHOTO BY SCOTT JOHNSON. Jr. Trappers, seen here at West Ferris arena early in the 13-14 season, will be moving to Mattawa for the 14-15 season. PHOTO BY SCOTT JOHNSON. In October 2013, just weeks into the North Bay Junior Trappers season, team president Dave Beauchamp said he saw the writing on the wall: low season ticket sales, poor fan attendance, sponsorship issues and the beginning of major issues to come with the city. Amidst the frustration, Beauchamp took a drive to Mattawa, just 45 minutes down Highway 17, to watch a local hockey game and, as he says, he knew then and there that he saw a future for his time in the town. Now, more than six months after that night, the organization have announced that their team will play the 2014/15 season as the Mattawa Jr. A Blackhawks. On Saturday, as the team was hosting a mini camp in Mattawa as the Trappers, the organization received NOJHL board approval to officially relocate the team, something that had been rumored for months. "We did have discussions one-on-one with players at our camp and explained to them that this is where we’ll be," said Beauchamp. Beauchamp insists the core of last year’s roster wants to return to the organization, despite the bumpy ride at times. “Obviously last year was tough on the players. I’d be naïve and I wouldn’t be a very honest person if I sat here said they all want to come back here with open arms,” Beauchamp admitted. Beauchamp, who is coming off a tumultuous first season as a team owner in the NOJHL, says with the advantage of hindsight he intends on using that insight for better days ahead. “I learned a lot this year; it was trial by fire,” he said. “I thought that I’d seen it all. But when it comes to hockey, it’s a whole other world. You really have to hold your head up and take things with a grain of salt. The Blackhawks will now look forward to renovations at Mike Rodden arena and their first full official camp under the new team name in July. North Bay’s future in the NOJHL? There is plenty of excitement elsewhere behind the scenes in the NOJHL as well. Team owners and league commissioner Robert Mazzuca are doing some spring-cleaning of their own, and North Bay is at the forefront of the agenda. Commissioner Mazzuca revealed that while the Trappers are officially packing up, there will also be a team in North Bay as long as the new ownership group is granted an ice contract from the city. Coming off a difficult season hampered by a last place finish in the regular season, a first round post-season sweep, an onslaught of off-ice issues with the city, and the Trappers officially moving to Mattawa, there is looming uncertainty about North Bay’s place in the NOJHL moving forward. Despite the challenging hockey landscape in the city right now though, Mazzuca was quick to assert confidence in the prospective ownership’s ability, who he could not identify at the time. “There is a group in North Bay, hockey people, financially stable and sound -- The kind of people you want to be involved in your league,” said Mazzuca. “They are all set, ready to go to put a team in North Bay. The ice contract is the first step in a 35-step process for new NOJHL team applications. If and when that ice contract comes to light, the other 34 steps will fall into place, according to Mazzuca. “What I can’t understand is there hasn’t been any new user groups in North Bay; the Trappers were in North Bay last year, they played out of West Ferris Arena and we worked with the city on some issues that we had with the Trappers; everybody seemed happy, everybody is happy,” said Mazzuca. With many writing off the NOJHL’s future in the city, the question remains: can a team remain relevant and successful in the current hockey landscape in North Bay? Even Beauchamp is a proponent of the idea and insists he doesn’t take notion personally. “It was no secret that we struggled at the gate. But if we have a strong fan base, there’s no reason why we can’t bring fans down to North Bay and help out the North Bay group too.